Thanks to the latest Lithium-Ion battery technology, there are no cables, petrol or pollution to worry about. Suitable for areas of grass up to 400m² or 500m², the cordless mowers are quiet and fuss free. The new lawnmowers are environmentally friendly with no fumes or emissions but without the restrictions of a cable. Battery mowers are ideal for areas of grass with no access to a power socket. Their light weight means it’s easy to manoeuvre around bushes, trees or other obstacles and makes them good for slopes, banks and areas that are awkward to reach. 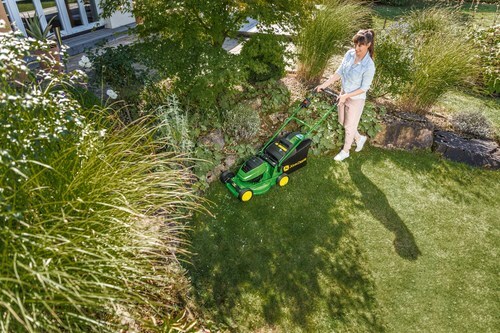 The long life 40-volt 4.0 Ah Lithium-Ion battery produces excellent mowing results, and performs particularly well for gardeners who like to mow a little and often. With a fully charged battery the cordless mower operates for around 20 minutes. Charging the battery takes around 90 minutes. The cordless mowers are easy to operate and to maintain with no regular servicing required other than replacing the blade every third season. The handles are easily adjusted, to cater for varying heights of operator and individual preference. They are also foldable, making the mower convenient to store where space is limited. Both models come with a two year warranty. With a cutting width of 40cm and polypropylene deck, the R40B cordless mower is suitable for a mowing area up to 400m². Weighing in at only 19.5kg, this light battery mower is easy to use and offers great manoeuvrability combined with high mowing and collection performance. The height of cut is simple to adjust, and the mower comes with a 44-litre collection bag. For even greater performance the second model R43B has a 43cm cutting width and an aluminium deck. Designed for areas of up to 500m², this cordless model has a 55-litre collection bag and six easily adjustable height of cut settings from 22 to 80mm.